Make sure you can see your baby’s face or eyes in the sling and that your baby can see you. Also, you should place the baby’s face at or above the rim of a sling or wrap so that their face is visible. 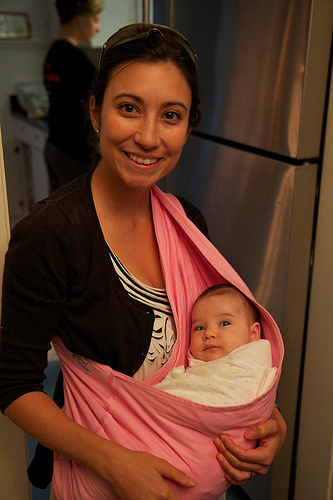 After nursing your baby, change the baby’s position in the sling, so that the baby’s face is at or above the rim of a sling or wrap and that their face is visible and clear of fabric and the mother’s body. You should be vigilant about frequently checking the baby in a sling. It was recently suggested on a (mainstream) pregnancy forum that those who birth with a midwife at home or in a birthing center do it only for the “experience”, and that the safest place to give birth is in a hospital “just in case” anything goes wrong. When I replied that midwife-attended homebirths were statistically safer than OB-attended hospital births, I was asked why that was. So, in my typical concise fashion (ha! ), I replied. So no, I have not planned a homebirth for the experience, for my own personal satisfaction, or because all the cool pregnant ladies are doing it. I have a planned a homebirth because for my low-risk pregnancy, a homebirth is the safest option. The developing fetus and baby are the most vulnerable to BPA,s and their toxic effects. Sadly, babies are often exposed to more BPA than any age group. Although completely eliminating exposure to BPA may not be possible, there is good reason to take every step you can to reduce your babies exposure. The FDA estimates that babies have 12.5 times more BPA exposure than adults, and EWG is concerned that FDA underestimates exposures for many babies. When infants are ready for solid food, experts say, start them first on rice cereal, available in a box, mixed with breast milk or formula. Babies have launched their eating careers this way for 60 years, says Alan Greene, a pediatrician at Stanford University’s Lucile Packard Children Hospital. In the 1950s, Greene says, baby food companies trumpeted the benefits of white rice cereal, telling mothers that it was easier for babies to digest than anything they could make at home. “The ads said, ‘You can’t feed children as well as we can,’ ” says Greene, author of Feeding Baby Green. Concerned about increasing childhood obesity and growing rates of diabetes, some pediatricians want to change how babies eat. He is concerned that babies are getting hooked on the taste of highly processed white rice and flour, which could set them up for a lifetime of bad habits, such as a weakness for cakes and cookies. Wow, lots of great information. I was wondering if you had any information regarding fluoride at the dentist’s office? I’ve been searching around for it, and I really can’t find anything. You provide such a wealth of information, maybe you can shed some light on this for me? Thank you again for providing this information, I will be following you regularly as of now. There has been a shift in dental advice on fluoride for children to only topical, not systemic. I do use fluoride toothpaste with my children, but we are fortunate we live in an area where we get our water from a spring. I think the biggest concern is not topical applications, but fluoride added to city water systems.